Like you, I strive to maintain a reasonable personal hygiene regimen, and on many days that will include the application of a deodorant to my underarms – that is, my armpits. About three months ago I was in my local Target, trying to choose just which deodorant was right for me. (There sure are a lot of them!) 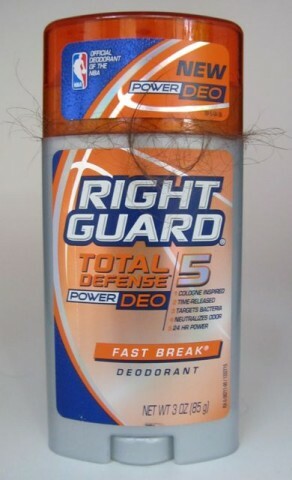 A coupon and a sale helped the decision process along, and I settled on something called “Right Guard Total Defense Power Deo 5 Fast Break Deodorant.” Unfortunately, despite “Fast Break” in its name and the package’s orange and blue color scheme, it was not scented like the slightly obscure – but still on the market – Reese’s candy bar. No, it had a pleasant sort of aftershave fragrance to it. Like I said, it was on sale and I had a coupon, so I bought it. Also, the label has this basketball design on it, and I figured that’d impress the fellas in the locker room. So I haven’t had any problems with it, but over the last few weeks, as it was getting down to the nub, you know what I noticed? It started smelling like hay. Like hay! Look, I grew up around horses, brother, so I know what hay smells like. I wonder if it’s the deodorant, or if the stink glands in my armpits are somehow synthesizing it and my perspiration to make it smell like hay. I don’t know. I just don’t know. Maybe this is why there’s all those PSAs reminding us to switch deodorants every so often. But I’m telling you, it smelled like hay. Anyway, I can’t wait until it’s on sale again! Posted by Ted on August 15, 2011, 9:00 AM.